At Aerojet Rocketdyne in Redmond, which made the rocket engines for NASA’s latest mission to Mars, the final "seven minutes of terror" as the lander headed for the surface were familiar, but still intense. That’s roughly how long it takes from the moment a spacecraft enters the Martian atmosphere at roughly 12,000 mph to the moment it touches down on the Red Planet. And during those seven minutes, there is nothing for people back on Earth to do but wait and hope. 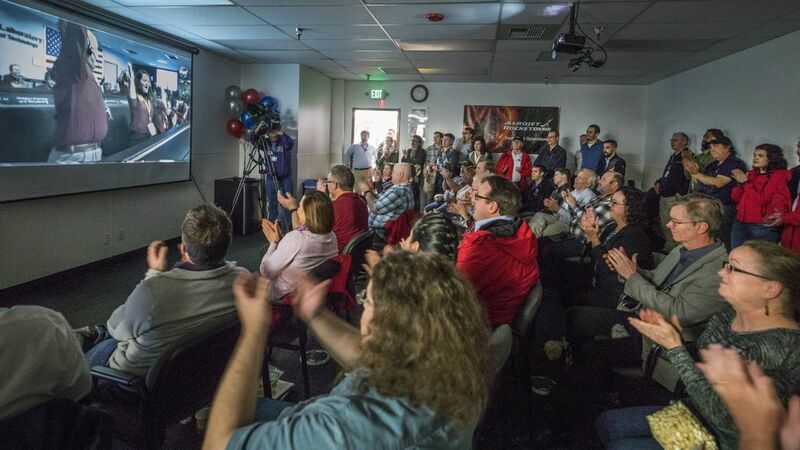 For the engineers and others at Redmond-based Aerojet Rocketdyne, makers of the rocket engines for NASA’s latest mission to Mars, those seven minutes came shortly before noon Monday. 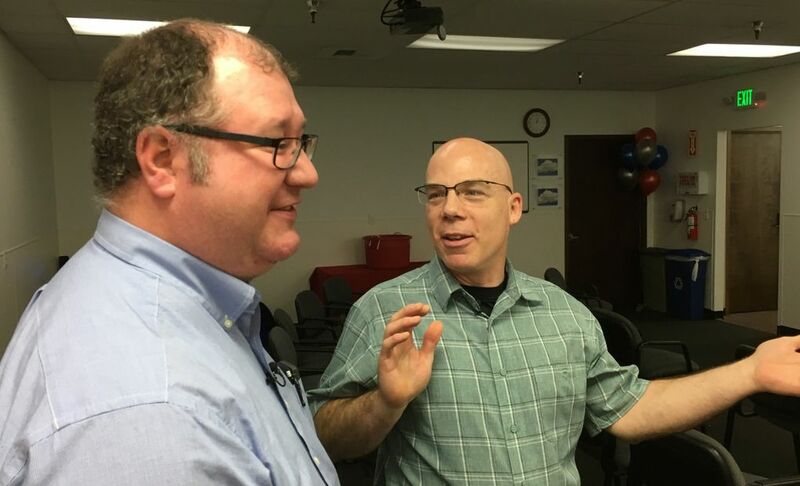 “My heart was just pounding,” said Matt Dawson, 45, chief engineer for the InSight project at Aerojet Rocketdyne, as he stood near the back of the company’s auditorium. Moments before, roughly 100 of Dawson’s colleagues had crowded excitedly into the room, their eyes riveted on two large screens carrying live video from mission control at the Jet Propulsion Laboratory in Pasadena, California. 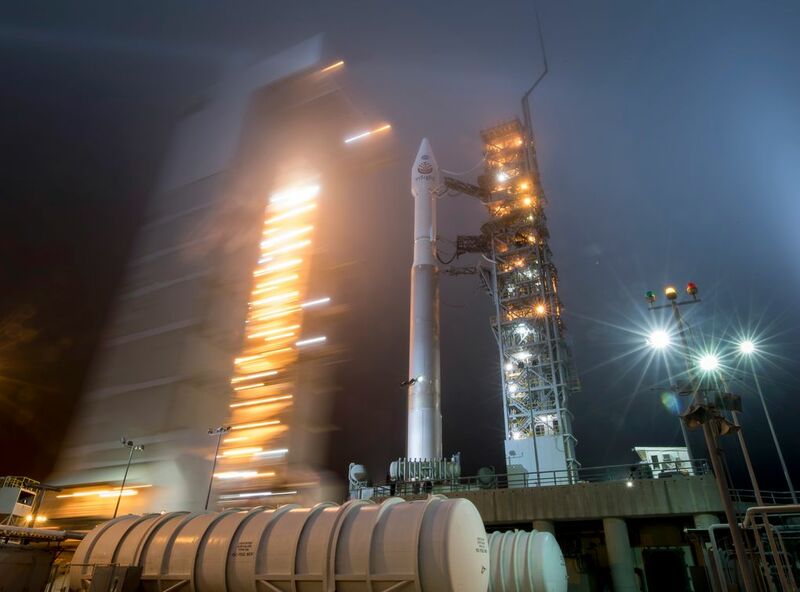 Six months before, the golf-cart-size spacecraft had been launched into space from Vandenberg Air Force Base in California. Now, after traveling nearly 300 million miles, the ship was making its final approach. As Dawson and his colleagues watched, the vessel plunged into the thin Martian atmosphere and began a combination of maneuvers — separation from its heat shield, deployment of a special parachute, and carefully timed pulses from the rocket engines — meant to slow the ship from its interplanetary pace to the speed of a jogger back on Earth. The atmosphere in the room was tense. Although Aerojet Rocketdyne is a veteran of many such landings — the company has been involved in all seven successful U.S. missions to Mars, starting with the Viking mission in 1975 — this final stage is just as excruciating. And arguably the most important. Various Aerojet Rocketdyne engines feature in every stage of the InSight mission, from liftoff to landing — “The pathway to Mars goes through Redmond,” quipped Ken Young, general manager of the company’s Redmond operations. But it is the descent engines that determine whether the multiyear mission, whose objective is to measure and map subterranean Mars, reaches the Red Planet in working condition. 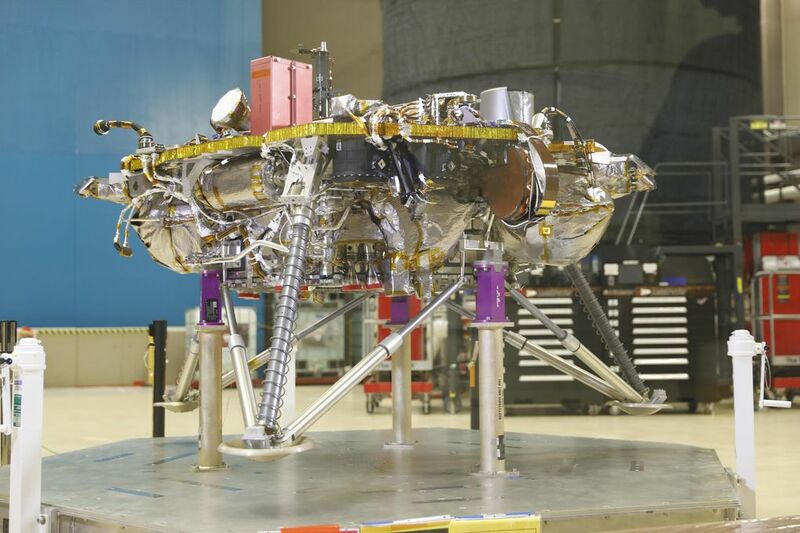 As the spacecraft falls to roughly 1 kilometer above the Martian surface, the 800-pound lander must separate from its outer aerodynamic shell and fire its 12 engines. Over the next few seconds, those engines maneuver the lander into a touchdown position, and slow the lander so that the final impact can be absorbed by its three spring-loaded legs. Those maneuvers can’t be controlled from Earth in real time. Mars is so far away that radio signals from Earth would take eight minutes to reach the spacecraft — too great a lag for such a delicate operation. Instead, the maneuvers are all preprogrammed into the flight controls. And sometimes, those programs don’t work. Most people in the auditorium Monday were probably keenly aware of the ill-fated European Space Agency’s Schiaparelli Mars lander, which crashed on Oct. 19, 2016, three minutes after hitting the Martian atmosphere, due to a data glitch. All of which means people like Dawson and Dooley can only watch and wait. “It’s a little nerve-wracking,” admitted Dooley. Indeed, as the technician at Mission Control began narrating the final steps of the landing process, the mood in the room turned palpably tense. At around 11:53 a.m., the lander hit the 1-kilometer mark. As onboard radar locked onto the surface, the lander separated from the shell and the 12 engines fired up. “Those are our engines,” yelled Dooley, to much relieved laughter. Seconds later, Mission Control began the altitude countdown, in a rhythmic rapid fire. The numbers started coming faster. The room went quiet. Then … nothing. The PA went silent. The room was so quiet you could hear engineers breathing. Seconds ticked by with agonizing slowness. Finally, 15 seconds later, the Mission Control technician said, “Touchdown confirmed.” The room erupted in applause and whoops. Moments later, after most of the Aerojet Rocketdyne employees had returned to work, Dooley and Dawson stood at the back of the room and talked about this edition of the seven minutes of terror. Both men were laughing about their own nervousness. But both were clearly relieved, even though they knew the relief was only temporary: Aerojet Rocketdyne is involved in yet another mission, NASA’s Mars 2020 Rover. In the months ahead, InSight will begin its study of the Martian underworld, with the aim of helping scientists understand how the planet formed, lessons that could help also shed light on Earth’s origins. It will listen for tremors — marsquakes — and collect data that will be pieced together in a map of the interior of the red planet. Its primary mission on the surface is to last nearly two years. It will attempt to answer a variety of questions: How often does the ground shake with marsquakes? Just how big is the molten core within Mars? How thick is the crust? How much heat is flowing up from the decay of radioactive elements at the planet’s core? InSight is carrying two main instruments: a dome-shape package containing seismometers and a heat probe that is to burrow about 16 feet down. NASA has spent $814 million on InSight. In addition, France and Germany invested $180 million to build these main instruments. 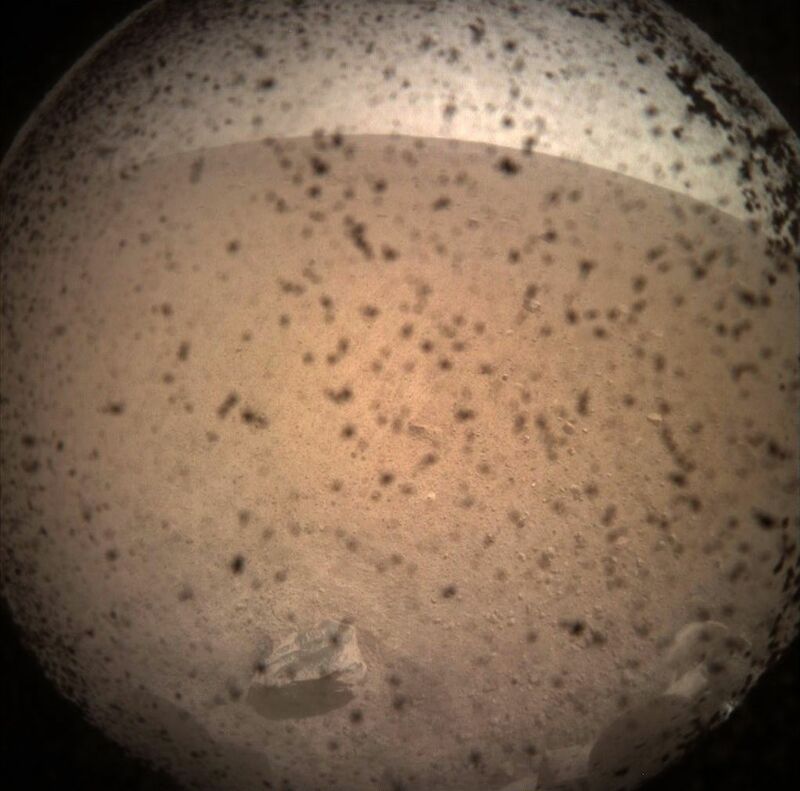 InSight’s landing was not NASA’s only success Monday. The agency used the mission to test new technology.